Sitting here at CHOA listening a mom of a patient and a teen age patient talk about cancer. It is a common occurrence here, different chemo drug references flying around and medical terms. IV benadryl or oral and the effect of it is the current topic of conversation out there in the hallway. Just a few minutes ago it was all about treatment end dates... wait, I just heard the conversation change to crack and heroin and how one of the kids is like she is on PCP when she is on steroid drugs... I concurr with that statement! It's an interesting mix of conversations here, some comforting some depressing. How are your counts? How did the IVIG make you feel. 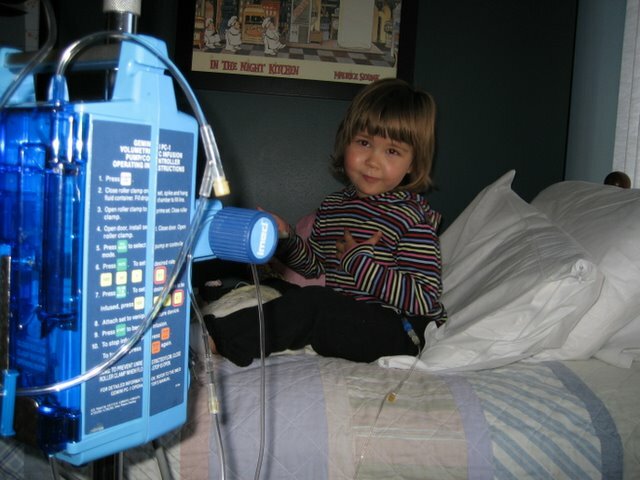 Speaking of IVIG or IgG (gamma globulin), that is the reason that we are down here again. We actually are here a week early because Abby hasn't been herself lately. She wasn't too bad until after the last treatment and then she just went down hill. Wanting her blanky all the time, eating a ton, and throwing up in the morning a couple times a week. Cough, green snot, and just the overall blahs got us in here quicker. Dr. Smith was wondering if she had a sinus infection and he wanted to get a CAT scan of her sinuses like he did last year. Last year they were all clear, this year... not so good. I figured it wasn't good news when he called me back to his computer to check out the pictures from the CAT scan. When the ENT (ear nose and throat) doctor, came in with us I really figured it wasn't good. The ENT gave me a nice drawing of where all the sinuses are and how they should be all air and look black on the CAT scan. He then proceeded to show me how, in the pictures of Abby's sinuses, they were all gray and white with very little black in most of the cavities... not good. What it is is a major sinus infection. Honestly I can't believe she just walks around with it and self medicates with her blanky and by sucking on her fingers... getting held by us when she can. If you've ever had a bad sinus infection then you know what she must feel like. The think is she doesn't really know how to describe it... she doesn't really know what a headache is probably. She just knows that, in her own words, "I don't feel good daddy". Makes me sad. But now we know so we can treat it. So, she'll be on antibiotics now for 3 weeks and then get another CT (CAT Scan). If that shows that it is all cleared up then great... if not, then she will have to have a sinus surgery to clear them out and see what type of bug the infection is so they can then give her more antibiotics, IV antibiotics if it gets to that point, that are targeted for the specific bug. Dr. Smith is optimistic since we now know why she hasn't been feeling good. He is giving her a 30% chance that the antibiotics will clear up the infection. The ENT is very nice, was very helpful, and draws a great picture of the sinsus cavities... but he only gives her a 15% chance of the antibiotics clearing it up. I hate percentages so I'm just going to pray that it clears up and that the antibiotics help it all clear up. He told me a bunch more stuff about surgery, the risks, the potenial complications, and some what if scenarios for people with a supressed immunity but they aren't real pleasant, so I'll keep them to myself for now. I'll keep you all posted as we go. Pray for the antibiotic that she is on to be the best one for this bug and to not give her any major side-effects like intestinal stuff. Thanks. I was once told "God doesn't pay attention to statistics." On the other hand, people do. I understand your concern and will be praying that the antibiotics do the trick. Praying....praying....praying for our precious Abby! Give her a big hug from her Aunt MeMe!